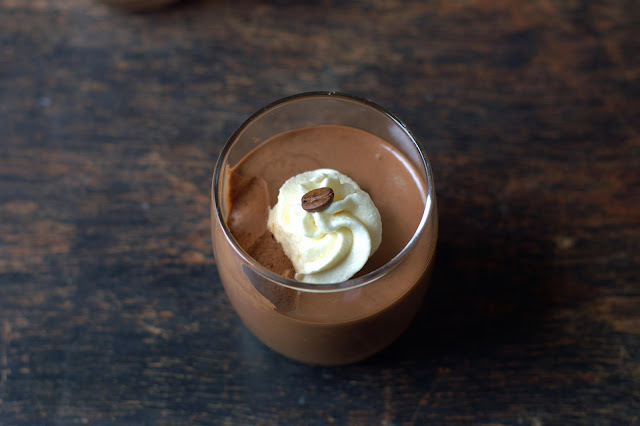 Rich, dark and decadent, bittersweet chocolate mousse. Need I say more? There are different recipes you could try to make this irresistible chocoholic's dessert. 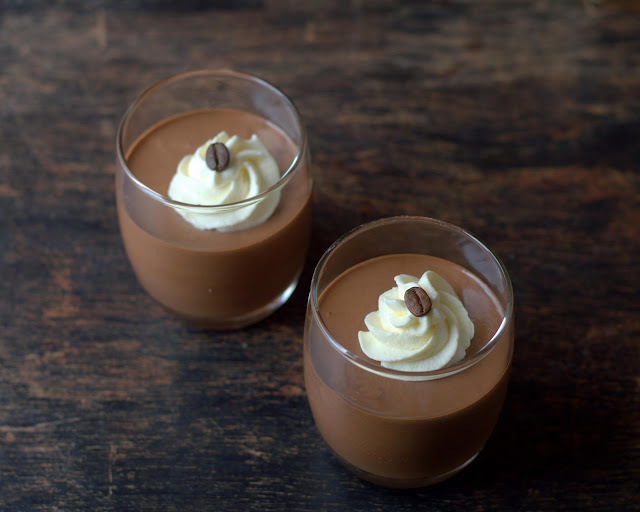 Whipped egg white is commonly folded into melted chocolate to make it light and airy. You can also simply fold in whipped cream into melted chocolate. Then there is Heston Blumenthal's revolutionary method where he makes mousse with just chocolate and water! Alice Medrich's Irish Coffee Mousse involves cooking eggs indirectly to eliminate the risk of salmonella, so on and so forth. I tried this recipe from David Lebovitz from his book Ready For Dessert and it turned out to be so good! Why wouldn't it be considering he makes it by folding in whipped cream into silky, smooth chocolate custard? Eggs do make a difference here. David suggests serving the mousse with Pear and Fig Chutney. Even if you are not adventurous enough to try that, please do try the mousse. Topped with some coffee whipped cream, you will love it! Method: Put the chocolate in a large bowl and set a mesh strainer on top. In a medium saucepan, heat the milk, instant coffee and sugar until the sugar dissolves and the milk is hot. In a medium bowl whisk the egg yolks. Very slowly dribble the hot milk into the yolks, whisking constantly. Pour the mixture back into the saucepan and cook over low heat stirring constantly. The custard needs to cook and coat the back of a spoon. Be careful not to overcook or it will curdle. Immediately pour the custard through the strainer, over the chocolate. Stir to melt until smooth. Stir in rum or cognac if using. Let cool completely. Whip the cream until soft peaks form. Let the cream come to room temperature. This is very important. Then gently fold in the whipped cream into 1/3 of the chocolate custard. Then fold in the rest gently until you see no streaks of cream. 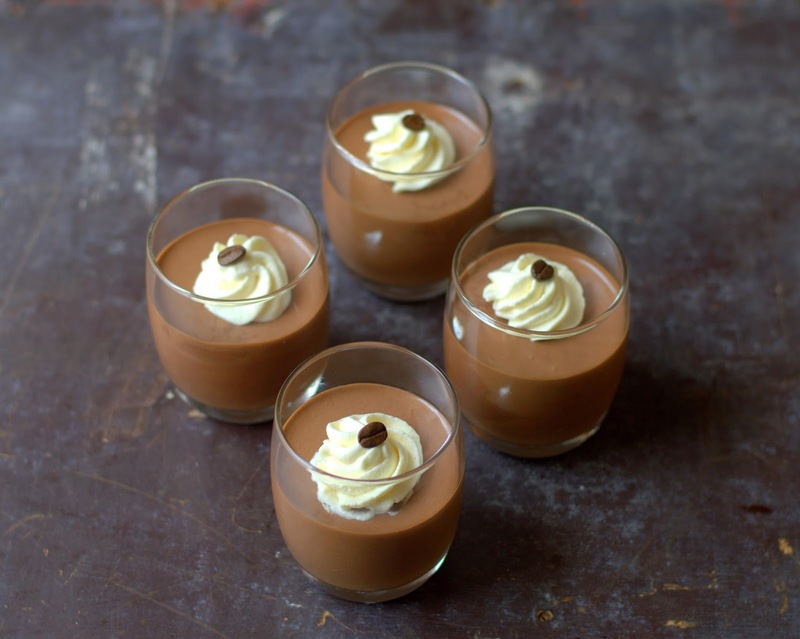 Spoon into glasses, keep the portions small, the mousse is quite rich. Chill until set, about 3 hours or over night. Author's note: You can transfer the mousse to a wide, shallow container before chilling to help it firm up faster. Confession: I folded in double the amount of whipped cream by mistake, but the mousse tasted just fine and quite rich. I will be making this again, will post an update here.